I have a confession to make: I would do just about anything for a Taco Bueno Beef Muchaco – seriously, it can be dangerous sometimes when I want one and we are very far from a store. 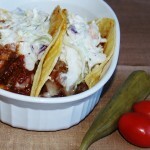 Those thick soft taco shells all supple and tender holding refried beans, taco meat, cheese, lettuce, and tomatoes – they call my name often. If we get fast food, Mexi Dips and Chips with a Muchaco is always my first choice with Son-In-Law always seconding that. Top Girl decided she liked them and finally Mr. Picky Eater brought up the tail-end telling us they were “pretty good”. 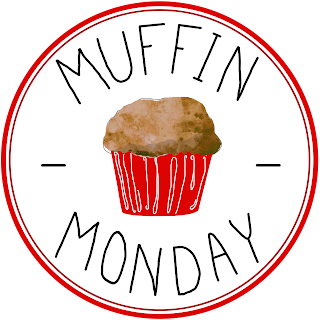 Last week, I decided that I could figure out how to make those delectable delights without too much trouble……I would just go to that website where you can get all the restaurant copycat recipes, right? Yep, did that – they just didn’t have the recipe. I ran over to my local Bueno and bought one – look HERE for their version. 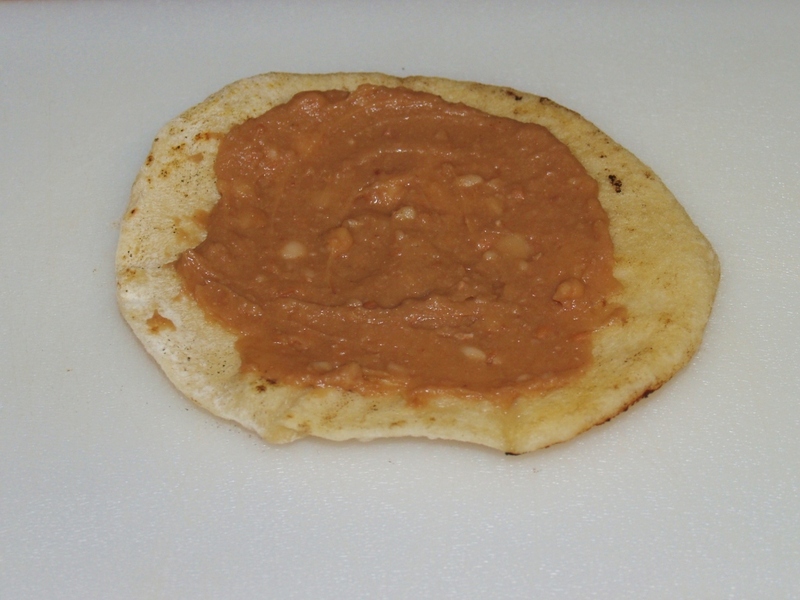 As I picked through it, eating all the way, the inside ingredients were going to be easy enough, just a taco with some refried beans but the shell, now that was going to take some thought. I researched a little and saw where Taco Bueno states the outside of a Muchaco is actually pita bread. 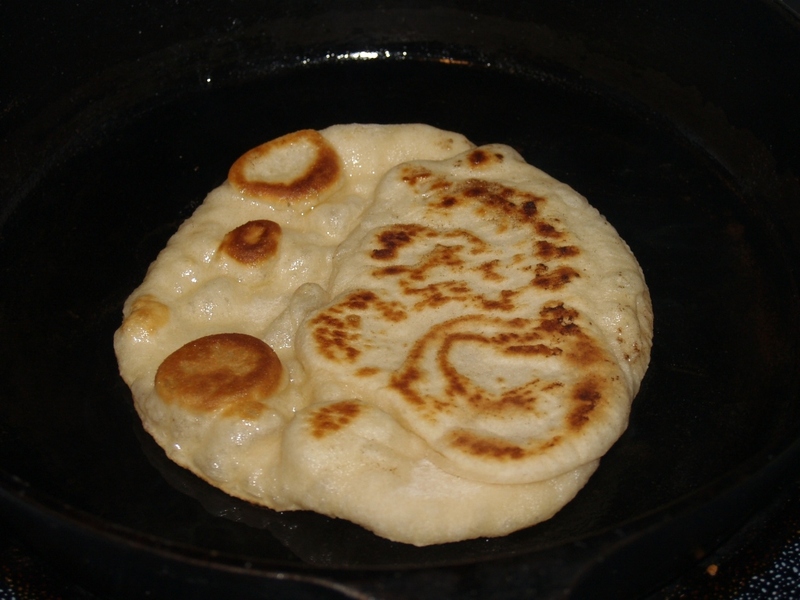 Pita bread? Really, because mine has always been dry on the outside and while it has a lovely pocket, I just couldn’t wrap my mind around it being the same thing I crave so often. 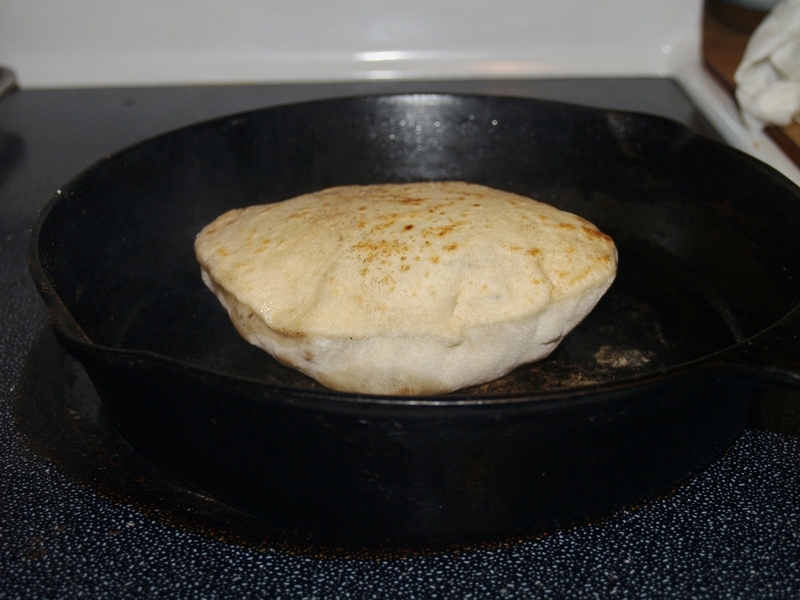 I went to Allrecipes and finally found a pita recipe I thought would fit the bill: Chef John’s Pita but I have recreated it here for you. However, if you want to watch the video, click on the link and it will take you there. 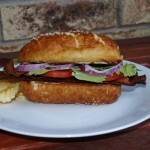 You are going to love this because it turned out perfect the very first time, made 10 and everyone loved them! Put first three ingredients into mixing bowl, whisk around 3-4 times, cover, and place in a warm place for 15 – 20 minutes so the yeast can activate. Using the dough hook on a stand mixer or beaters on a hand held one, mix slowly while adding the olive oil, salt, and 1 ½ Cups of flour. 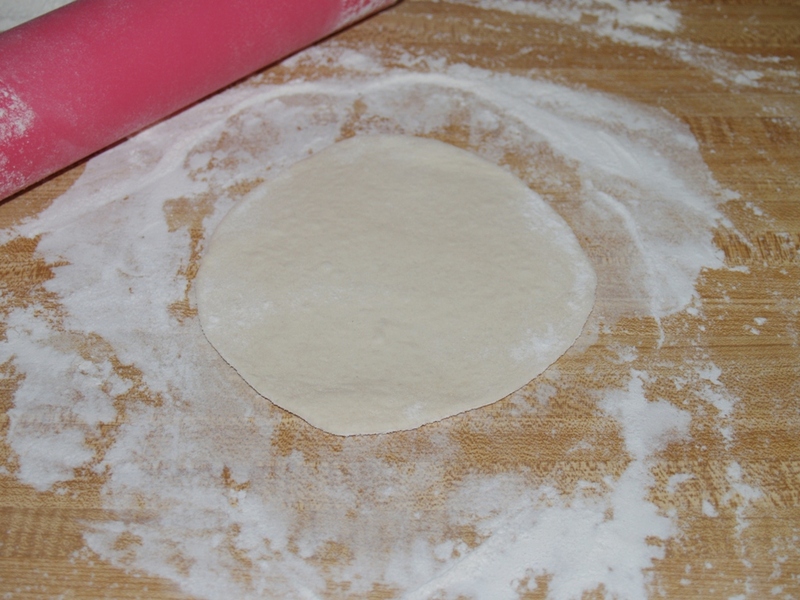 Mix until the dough is soft and supple and just a little sticky – but if dough is still sticking to the sides, add flour. It will take 5-6 minutes of mixing. Turn out onto a lightly floured board and form into a ball. Put olive oil into a bowl and swirl around then put ball of dough in flipping once to cover. Cover bowl and set in a warm place for 2 hours. 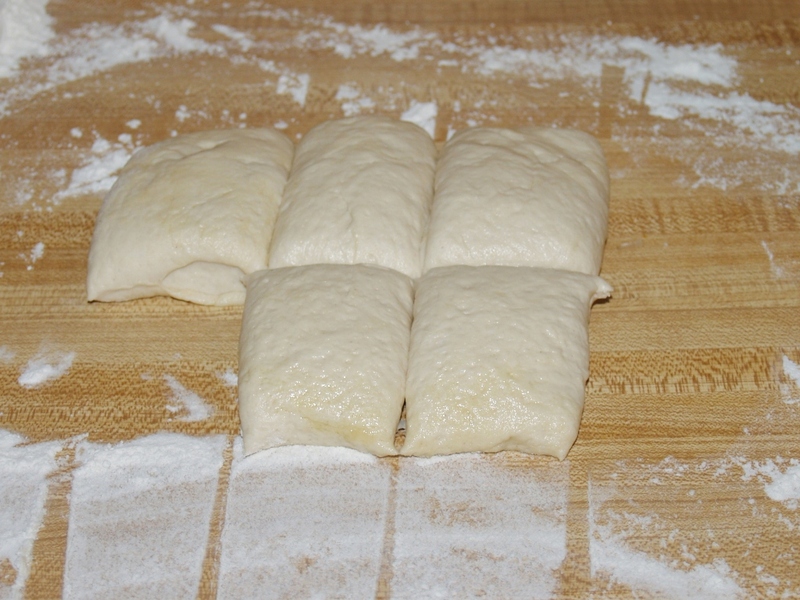 Again, turn out dough into a lightly floured board, with lightly floured hands, pat out to about a 1 inch thick rectangle then cut into 8 pieces………I cut mine into 10 and it was perfect! Then roll each piece into a ball and place on parchment paper sitting on a baking sheet and cover with a sprayed piece of plastic wrap. Allow dough to rest for 30 minutes. 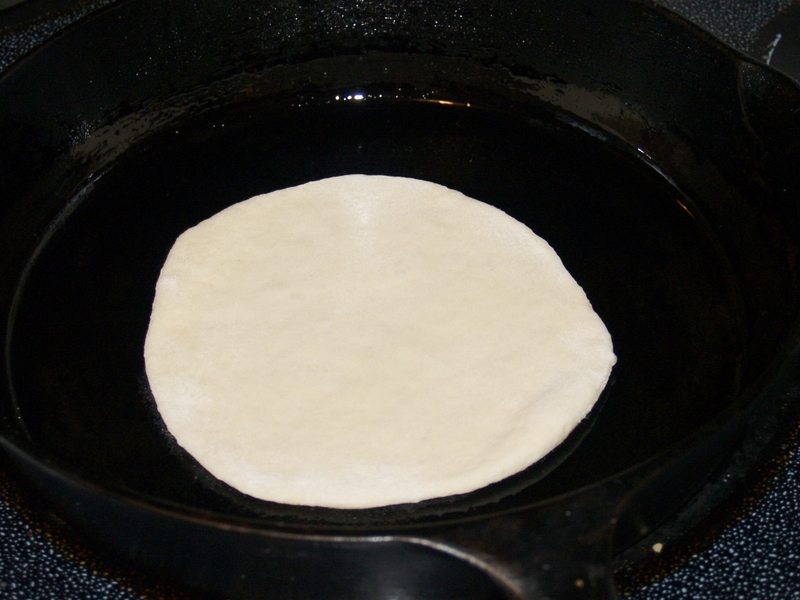 Then put an iron skillet (I’m sure you could use any skillet you wanted) on a burner set at Medium. 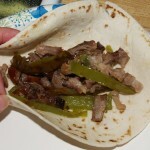 (Chef John says Medium High but lots of the reviews said it would burn – and they were right) with just a bit of olive oil in it. You will need to add bits of the oil after every 2 or 3 pieces. When I took each off and put another on, placed it on a platter covered with paper towels then on top I put a clean tea towel over top with a damp one over that one – they stayed WONDERFUL and beat anything you could ever buy in a grocery store………….EVER! If you want it to be a pita, just cut them in half and coax the insides open and fill. 1 lb. 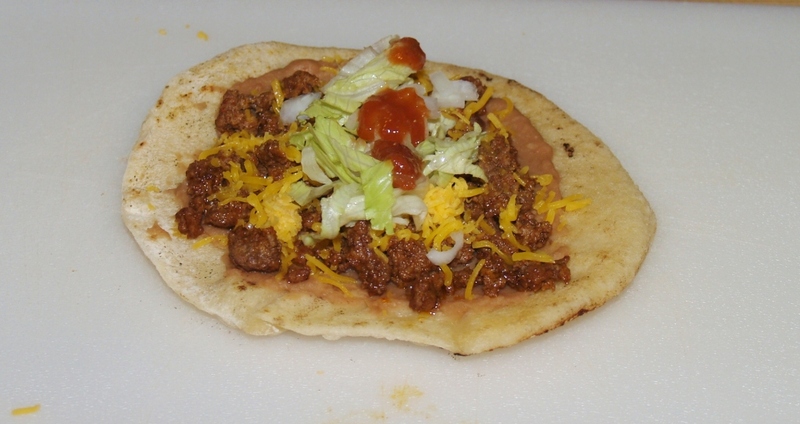 ground beef cooked with Taco Meat seasoning (I use Old El Paso). Shredded cheese, lettuce, tomato, onion, and salsa………….some people would add cilantro, but thankfully it’s not in Taco Bueno Muchaco and it’s not in mine either. Lay down 1 piece of bread. Put meat and cheese on top. 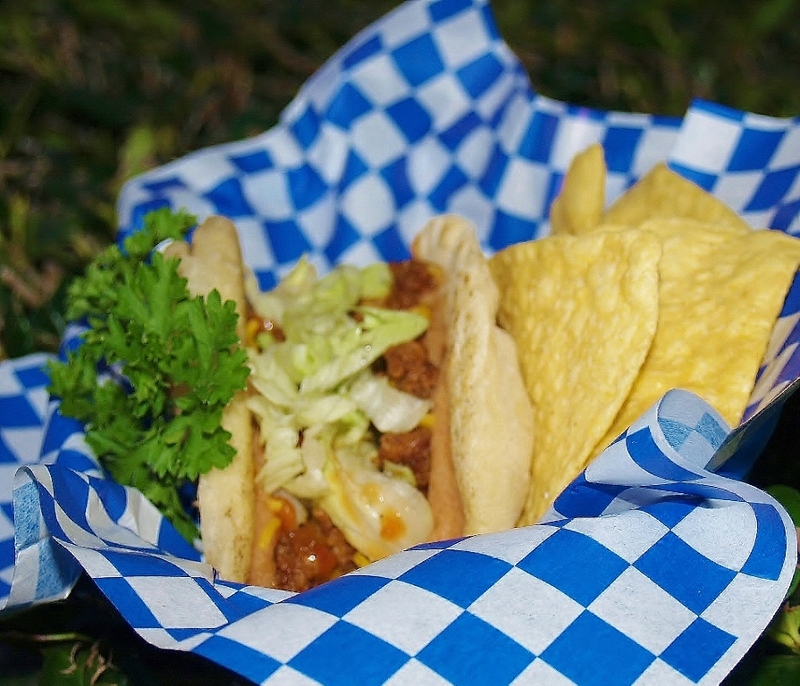 Fold up like a Taco and let the joy of Tex-Mex goodness engulf you! BTW, no one paid me or gave me free product to use their brand names, I just really like the brands I use so I’m telling you about them like one friend would tell another. The big Batman Extravaganza for Halloween is coming up on the 31st and 1st – if you remember the theme was Wizard of Oz last year. I will share pictures next Sunday. In the meantime, Here is a Halloween wish from Rocket and me! I’m linked up over at Weekend Potluck this week – so come on over and check out the great recipes! Previous Post: « Norman Kid’s Magazine – Is your picture in it? I’ve never had one, but they look wonderful! I pinned it so we can try it. Not sure if I can get my mr picky eater to try it! He is so picky! I want to thank you so much for the MUCHACHO recipe we live in Colorado and every time we are in New Mexico we have to stop at a Taco Bueno to eat their Muchacos but yesterday while in Albuquerque N.M. we got some terrible news The TACO BUENO restaurants are closing their doors February 28th my son was very disappointed so today I decided to find the recipes online and surprise him with the muchacos thank goodness for computers and generous people like yourself who share recipes with others you have no idea how happy this is going to make my family. Patricia Ramos in Pueblo Colorado. Great Pat – I am thrilled that you like the recipe – I’m sorry Taco Bueno is closing it’s doors and honestly I hope it’s only in Albuquerque where that will be happening! 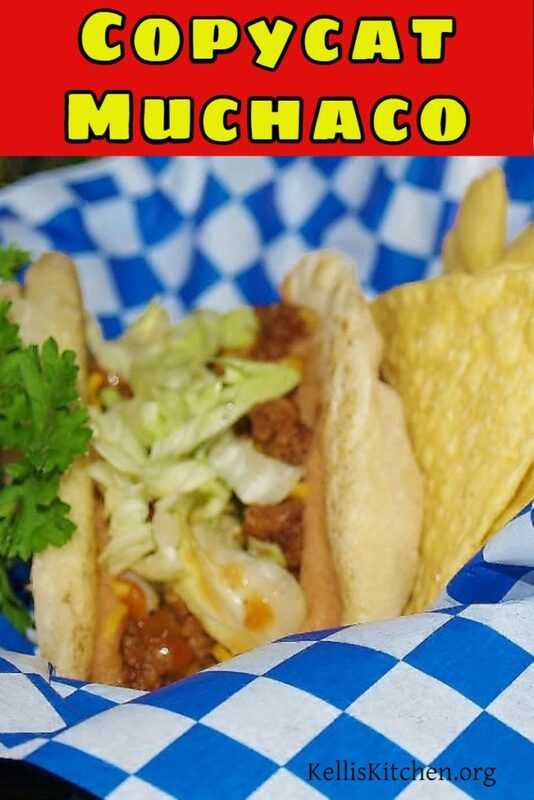 Enjoy the muchacho recipe – I just made them the other night and they were all gone quick as a wink! I too have a confession: I’ve loved Muchacos for more than 25 years. In the early days of my radio career, Taco Bueno sponsored the football broadcasts (I was the play-by-play guy) and they wanted to make sure that the on-air personalities had carte blanche at the local restaurant. Well, I took advantage. And I became addicted. I’m both ashamed and extremely pleased that you have posted a copycat recipe for this fit-for-the-afterlife guilty pleasure. 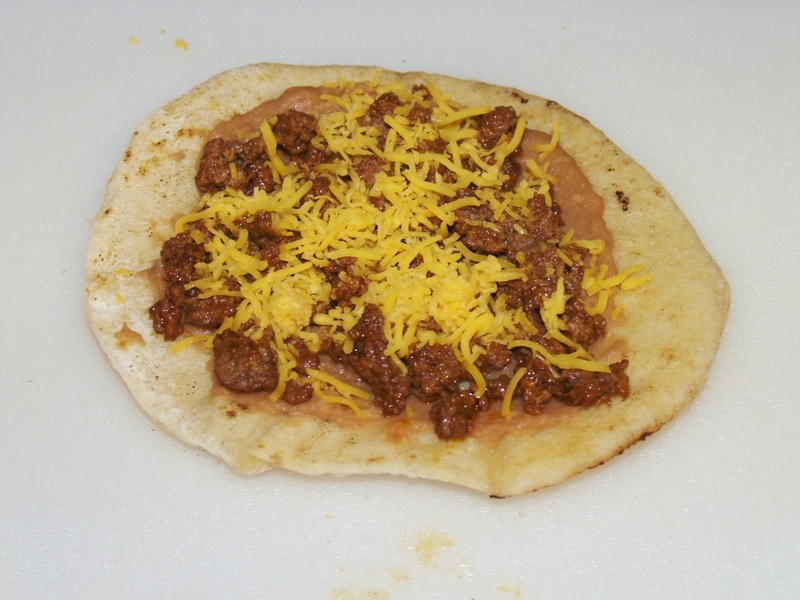 I’ve only every concocted the copycat recipe for Schlotztsky’s, but the Muchaco (ground beef) runs a close second. Thankfully, you’ve done all the work for me. 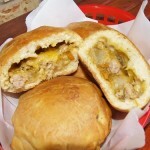 I just want to say to folks outside our little southwestern region that this dish is totally worth a try. As for my photos.. You’re too kind. I’ll be shooting with another camera soon. I’m finally getting a new lens. My husband was a newspaper journalist and photographer (as well as radio man who did remotes) so I got his camera. I’ve got a kazillion dollar camera and 50 cent talent! 🙂 But I’m learning. I love Aldi salsa also!!!! 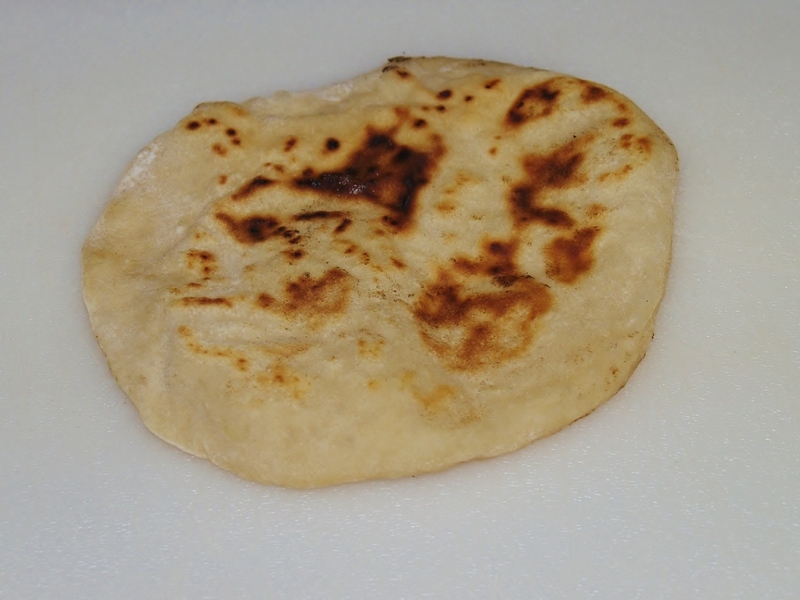 And I grew up in San Antonio, Texas, no Taco Buenos there…I’m afraid of yeast but your pita bread recipe has inspired me. I’m going to try it. Sounds wonderful. 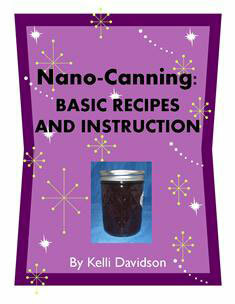 Thank you for developing the recipe!!! I’m afraid of yeast too! This new jar is only the 2nd one I’ve ever bought but seriously, this is too easy. Glad to know someone else likes Aldi’s salsa too – it’s great, isn’t it? Reminds me of El Fenix – a Texas restaurant that still has 1 place in Oklahoma just across the line. We, unfortunately, don’t have Muchachos here, but we will soon! At least at our table. Gotta try them. One thing, many, many of the recipes I’m seeing do not use, or even mention, instant yeast. I bake a lot. A lot. And next to girls and sliced bread this is is the greatest invention ever, IMHO. It would be much appreciated if you and your fellow bloggers would include the amount of Instant Yeast as well as the regular type. I might also mention that it’s MUCH less expensive than those little foil envelopes and sealed properly keeps for ages in the freezer. I get mine at a restaurant supply store open to the public and pay only $3.95 for 16 ounces! I will certainly try it – I’m kinda’ afraid of yeast and am always pretty tense so I write down exactly what the recipe says, take it to the store and then buy it – but I will read up on it and get some! So does that mean instant yeast doesn’t have to sit around and bloom? or does it mean it doesn’t have to sit around and rise? No, just mix it with the dry ingredients. It doesn’t need to be proofed at all and in the years I’ve been using it, it has never, ever failed to work. Try it, you’ll love it. 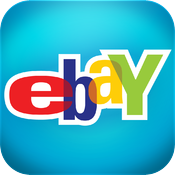 There are conversion tables available on the web to acquaint you with it. Happy baking! Oh, you still have to let the dough rise. No way around that, I’m afraid. But that’s part of the fun of baking. This sounds great! Thanks Dave! My years package says that 2-1/4 teaspoons is what is in each individual pkg. Dumb question — in step 1, do you mix the flour, yeast and water together or just put them in the bowl in order given? Just whisk it around say, 3 or 4 times and then just cover it up. I should have put that in – I will edit it. Thanks! I’m not familiar with muchachos but I like the idea of the bread. I also agree completely with Dave regarding the yeast. 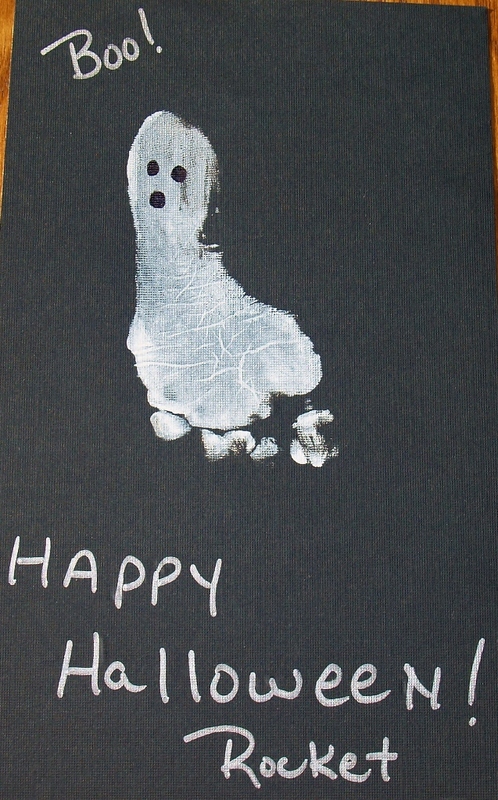 Thank you and Rocket for the Halloween greeting. You are welcome – and I am going to try this yeast. maybe it will quell my fear of it! I would happily enjoy your tacos, believe me! They look so delicious! I am a Taco Bueno addict. I love their beans. I am thinking this might take he place of pizza night tomorrow. You will not be sorry Debra – seriously. this bread stuff is not only easy but tastes exactly like the kind at Taco Bueno! Hmmm… this did not work for me at all. I am excited about being able to make home-made muchachos.. but it doesn’t seem like 1 cup of water was enough. Can you clairify a few things for me. 1.) The dough, when mixing ,was a bunch a small pieces that never came together, any idea of what happened? 2.) when you say 1 and 1/2 cup of flour, what type of flour? Is it all-purpose throughout the entire recipe? It really seemed like there was not enough water… maybe i packed my flour too compact and it was more than the recipe called for. I’m the farthest thing from an expert, any help is appreciated! Sure Eric – I’ll be happy to help. Firstly, I have found that when making bread products using flour (and it was all All Purpose Flour throughout) the weather and/or environment conditions always have me adjusting the water this way and that way – and I did not compact my flour at all so possibly you had more but you could have added more water a Tablespoon or so at a time until it had the right consistency. However, the small pieces should not have happened. Did you add the 2nd part of the flour a little at a time? It seems your flour must have been stiff and too much flour so more water was in order – it should have the feeling of a memory foam pillow (if you know what that feels like) when it’s ready to take out of the mixer bowl. was the yeast or flour out of date? When you added the first 3 ingredients – did you put it in a warm place and let it bloom? I know it works because we’ve had them many times but the 2nd amount of flour is always just a little bit different for me so maybe that is the problem – you added the entire 1 3/4 cups when it didn’t need that much. 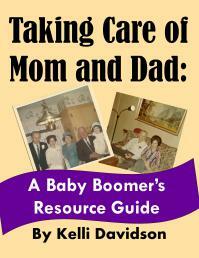 Can’t wait to see how they turn out – anytime you have a question – just post here and I’ll get back to you!